In light of the Lord Mayor’s recent official reception for the officers of a British Naval vessel docked in Cork, Sinn Féin Councillor Jonathan O’Brien argues why his party wants a review of Council policy towards all foreign military visits to the City. Up to the 1930s the sight of British warships in Cork Harbour was a regular feature. The terms of the Treaty of 1921 allowed them continuing access to our port to suit Britain’s military and strategic interests. It was De Valera and Fianna Fáil, who above all others demanded respect for Irish neutrality by the British and the return of the port to Irish control. Increasingly in recent years, however, residents of Cork City have been witnessing the docking of British and other foreign war ships at Cork Harbour. Even more disturbing has been the apparent fawning over the British military whenever they arrive in the City by some Councillors and in fact, what seems a now customary reception for their officers in the Lord Mayor’s chamber. Why do some members of City Council feel compelled to extend a red carpet to the British military during their visits to Cork Harbour? Sinn Féin opposes the presence of the British military in Cork and in particular official welcomes for them, not because of some knee-jerk anti-Britishness, but due to deeply held concerns about Cork City and Ireland generally being associated with the British military in today’s world. Sinn Féin believes that such an association not only contravenes our state’s long held adherence to a policy of neutrality in international conflict, it also associates us with British and U.S military adventures in Iraq and other parts of the developing world. In Iraq, British and U.S. military activities have contributed to the deaths of tens of thousands of Iraqi civilians. The British Navy in particular has played an important role in many of those deaths through the delivery of British soldiers, weaponry and logistical support to the area as well as by providing a launch pad for aircraft and missiles to bomb the local population. This war is not supported by the Irish people or by the vast bulk of the international community. It should not be supported by Cork City Council either which is what in effect these wine and cheese parties represent. The Council is also deluding itself if it believes that this fawning attitude towards the British military is somehow helping the peace process in the North. There, despite massive political progress over the past decade, the nationalist minority still views the British military as an occupation force. Besides this, the British military remains the only side in the conflict to have continually refused to come clean about the extent and nature of its operations in Ireland North and South, thus denying the development of proper truth mechanisms and closure for the families of their victims. Indeed, the recent (July 2008) United Nations Human Rights Committee Report highlighted the continued delay in holding Inquiries into a number of controversial killings, interference in the independence of these inquiries and the lack of any prosecutions, as areas of concern. The families of the victims in the Monaghan and Dublin bombings, the Bloody Sunday Inquiry, and other inquiries such as those into the killing of solicitors Pat Finucane and Rosemary Nelson, have all been hampered by the refusal of the British military to provide information about its involvement, as have the various investigations into the extent to which the British military ran the loyalist sectarian assassination campaign. John Stalker’s investigation was successfully frustrated and shelved for example, while the Stevens Report (which is still unpublished) took 14 years to complete due to the lack of cooperation provided by British military figures about their war in Ireland. Interestingly, despite the limitations obviously placed on Stevens it seems he was still able to report enough to disturb the former Church of Ireland Primate Archbishop Eames. Normally a staunch supporter of the British military in Ireland he made it clear after reading the Stevens Report, as part of his role on the ‘Consultative Group on the Past’, that he had been shocked by extent of British military involvement in sectarian killings revealed therein. If the British military is serious about peace and reconciliation in Ireland it needs to help in the process of providing closure to victims’ families. 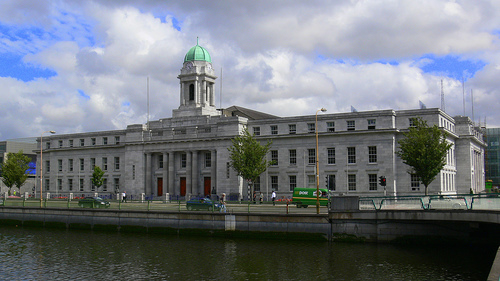 Cork City Council should certainly not be rewarding its refusal to do so with official receptions in the City Hall. The Lord Mayor is perhaps honestly trying to promote good relations between the islands of Britain and Ireland in a post Good Friday Agreement era. However, the fact that he feels the necessity to continually find ways of associating himself and Cork City with the British military suggests – in the light of all I have said above – at the very least a naivety and lack of understanding of the impact this may have both on a national and global scale. The previous Lord Mayor’s bestowal of the Freedom of the City of MacCurtain and MacSweeney on former British Prime Minister John Major, for his supposed positive involvement in the peace process, seems to confirm this. The notion that John Major could be seen to have contributed positively to ANY peace process must have come as a surprise even to him. It actually made ‘rebel’ Cork look ridiculous in the eyes of people close to the peace process. John Major is of course the same man who orchestrated, along with George Bush Senior, the first war on Iraq and who oversaw the British military’s collusion with death squads in the North. He’s the same man who, in 1996, two years into an IRA ceasefire, still refused to open up talks with republicans, maintained the British military on a war footing in the north and colluded with the Ulster unionists in order to remain in power – an approach which eventually led to the breakdown of the ceasefire. Instead it took Tony Blair to get the whole peace process back on track again when he was elected to office in 1997. Sinn Féin believes that Cork City Council and the Lord Mayor in particular need to seriously reconsider the impact these types of decisions have both in Ireland and globally. At best they make us look ridiculous in the eyes of the world; at worse they align us with the perceived oppressors of many in the world.